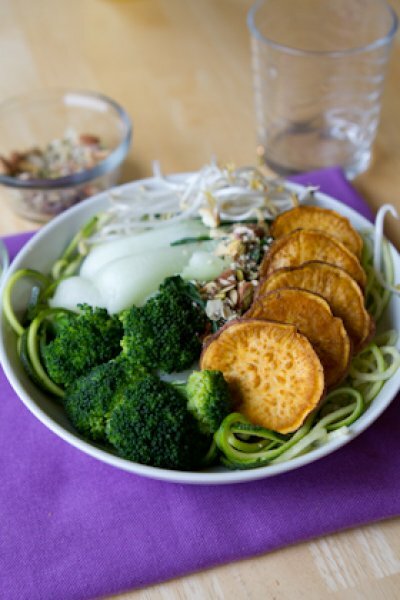 Soothing bowl of greens topped with sweet potato rounds, protein boost nut and seed mixture and homemade green dressing all served on a bed of zucchini noodles. Preheat oven to 400F and line a baking sheet with parchment paper or a silicon baking mat. Brush sweet potato rounds in oil and sprinkle with cumin. Place on prepared baking sheet and cook in the prepared oven for 25 minutes, flipping halfway through. Meanwhile, place zucchini noodles on a large plate. Set aside. 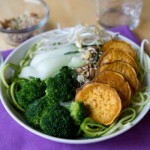 Place bok choy and broccoli in the bowl of your steamer and steam for 2 minutes. Remove and spread over top zucchini noodles.